On 24 July 2015, Turkey officially launched its two-front campaign against PKK in northern Iraq and the Islamic State jihadist group in Syria, marking Turkey's first military involvement in the US-led campaign against ISIL. The week had seen a surge in violence in Turkey, which shares southern borders with war-torn Syria and Iraq, stretching 510 miles and 220 miles respectively. Turkey said it had secured an agreement with the Obama administration to jointly secure a zone in a small part of northern Syria. But while US officials confirmed the outlines of the deal, discrepancies in how Washington and Ankara view the buffer suggests the accord was not complete. 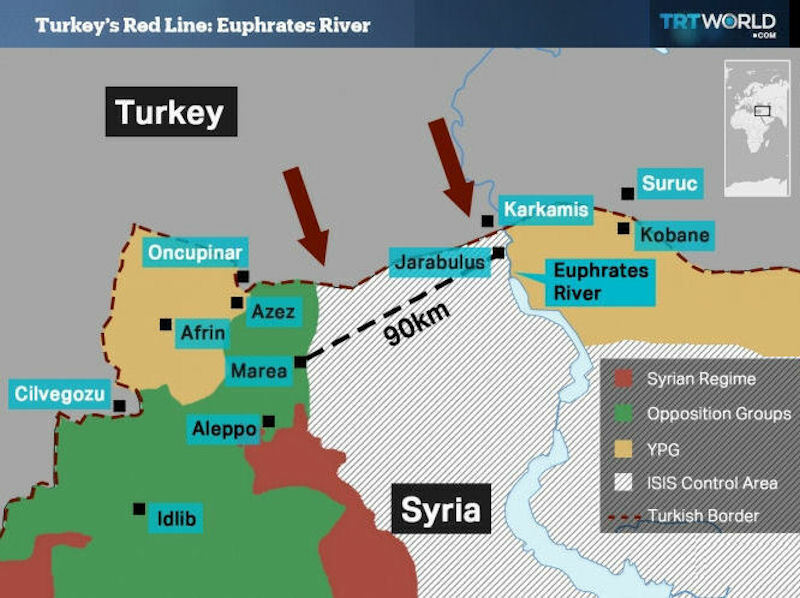 The zone's proposed area would extend along a 68-mile stretch of the Turkish border and reach 40 miles into Syrian territory, west of the Euphrates River, and into the province of Aleppo. The area was controlled by the Islamic State group (IS), between two areas of Syria currently held by Kurdish separatist militias linked to Turkey’s outlawed Kurdistan Workers’ Party (PKK). ISIL’s strategy to re-establish a 7th century caliphate relied on its shrewd exploitation of 21st century technology. It was especially adept at exploiting the explosion in social media to establish its legitimacy, create fear in its enemies, attract more fighters, carry its message across the globe, and spread its network. Peter Kassig was beheaded in Dabiq, Syria. Dabiq features in a recorded statement attributed to the Prophet Mohammed, known as hadith. The hadith are very important to Muslims and are regarded as providing another source of law alongside the Koran. Dabiq features strongly in the eschatological aspects of normative Islamic belief. Dabiq was referenced by Mohammed as the location for an end-of-times battle of the crusaders before taking Istanbul. The zone being talked about by the Turks not only includes towns of strategic and symbolic importance for the Islamic State group like Dabiq, but also towns such as al-Bab, which has been targeted by Syrian helicopters and warplanes, risking clashes with the Syrian government. Syria's Kurds or the YPG, which is linked to Turkey's Kurdistan Workers Party (PKK), now controlled half of the country's 800km border with Turkey by 2016 - stretching from the Iraq border to the town of Kobane. The North Atlantic Treaty Organization held an emergency meeting in Brussels following a formal request by Turkey to discuss the security situation on its borders. The extraordinary meeting at the NATO headquarters on Tuesday was the fifth in the organisation's 66-year history. It was requested by Turkey under Article 4 of the treaty that founded the US-led alliance, which empowers its 28 member states to seek such consultations when they consider their "territorial integrity, political independence or security" to be in jeopardy. A US official told news agencies the goal is to create an "Islamic State-free zone" to "ensure greater security along Turkey's border with Syria." But the official said the joint US-Turkey military operation would not include the imposition of a no-fly zone in the region, a long-standing Turkish demand. On 24 August 2016, Ankara sent its warplanes, tanks and special forces assisted by the Free Syrian Army across the border to ostensibly free the town of Jarablus and prevent the Kurds from advancing further West. Damascus denounced the intervention as a breach of its sovereignty. 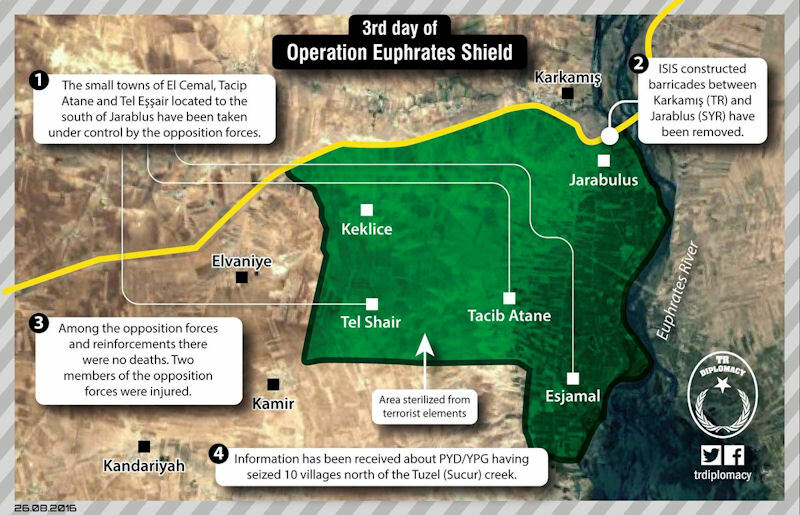 Euphrates Shield operation is considered to be the first Turkish ground intervention in Syria since the Syrian crisis started in 2011. In 2015 Turkish authorities launched a military operation in the southeastern regions of Turkey, populated mostly by the Kurds. In response, Kurdish militants carried out terrorist attacks in the country. Official Ankara stated that the military operation had only the purpose of the fight against terrorist groups. "We strongly condemn all attempts to present the operation as a struggle with the Syrian Kurds and their military achievements",Ibrahim Kalyn, a spokesman for the Turkish President, stated 21 August 2016. Turkish authorities also intended to fight the Kurdistan Workers' Party and the Democratic Union (PYD), considering them terrorist organizations, said Kalyn. Another purpose of the operation, according to Kalyn, was Al-Bab ["the gate"], a major city halfway between Aleppo and Jarabulus. Al-Bab is located in the middle of the stretch of territory controlled by Daesh militants, and was their stronghold in the area. 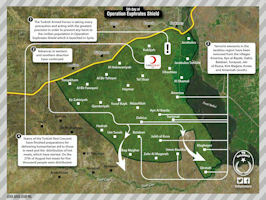 The Kurdish forces were also seeking Al-Bab, to connect with the territory they control in the west of the country. According to Erdogan's press secretary, this task interfere with the action of the Kurdish units in the rear of the Turkish army in their progress to liberation Jarabulus. "We are not talking any more about any deadline for the retreat of the Kurds to the eastern bank of the Euphrates. We simply demand the retreat as soon as possible", said Kalyn. Al-Bab can become a place of serious clashes between Kurds and Turkey. Washington, which supports both the Kurds and the Turks, was trying to prevent this, and tried to slow down the advancement of the Kurds by diplomatic means. At the outset, the United States verbally supported the operation. In fact, according to one report, the Pentagon even offered Turkey the possibility of a joint operation with the participation of 40 US commandos, a plan that was allegedly shelved as a result of the White House's slow response. But nevertheless, the US was supportive of the operation in its initial stages. US officials called upon the Syrian Kurdish People's Protection Units (YPG), the Kurdistan Workers' Party's (PKK) sister organisation in Syria, to withdraw to the east of the Euphrates river and threatened to withhold support should they not comply. As time went on, the US changed the tone, calling on Turkey to refrain from clashing with the YPG and instead has begun urging it to focus on the common enemy, ISIL. Interestingly, both Turkey and the YPG are Washington's key allies in the region. This is why the Turkish military and Kurdish militias largely refrained from large-scale armed hostilities, although occasional fighting had taken place. The United States pressured both sides to focus on fighting Daesh and not each other, urging the Kurds to move east of the Euphrates. This standoff could escalate if Turkey did not pull its forces out of Syria. Turkish Foreign Minister Mevlut Cavusoglu said the operation was also aimed at preventing the YPG from taking more territory with the aim of linking the Kurdish cantons of Kobani and Afrin, which would create a continuous corridor of territory under YPG control running along Turkey's border. The Turkish Armed Forces expected the Kurdish troops will leave the city of Manbij. If they departed, Turkey would be able to open a corridor to Aleppo for the Syrian opposition. Ankara was likely seeking to carve out a region under its control along the border about 100 kilometers long and 30 kilometers deep, running between the Syrian border towns of Jarabulus to al-Rai. That, say analysts, would provide Turkey with a base to prevent further YPG gains. The most important point is the duration of the military operation, which Turkey holds. 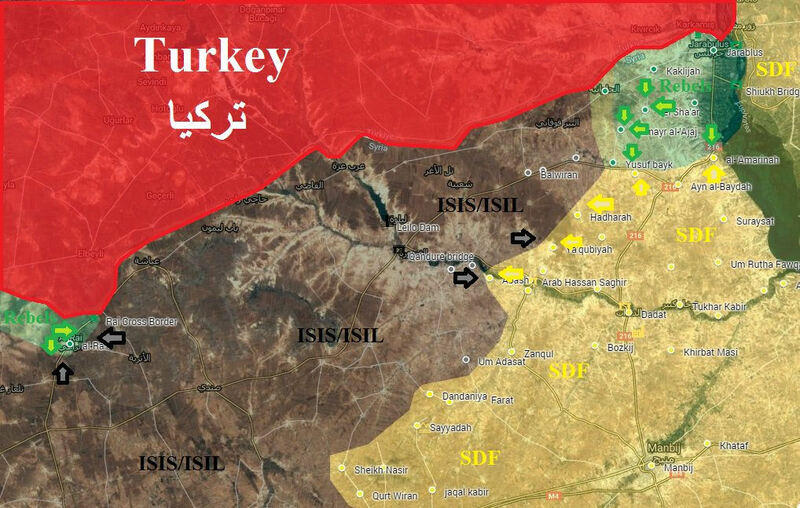 If the "Euphrates Shield" becomes protracted (more than 2 months), it will certainly lead to serious losses for Turkish troops, who did not miss an opportunity once again to strike the forces of Syrian Kurds. Soldiers of the People's Self-Defense Kurds (YPG) have already demonstrated that they can force the fight Turkish forces - they destroyed Turkish tanks using anti-tank missile system (ATGM) on 27 August 2016. By 27 August 2016 the SDF had continued advances at the western bank of the Euphrates, seizing 2 more villages from ISIS. Since the start of Turkish military operations in northern Syria, the SDF had captured over 10 villages south of Jarablus. The Turkish Air Force responded to these actions with fresh air strikes on SDF targets south of Jarablus. Air strikes were reported at the vilalge of Amarna and allegedly inflicted civilian casualties. Near the Turkish border, the Free Syrian Army claimed dramatic advances against the Islamic State, capturing Zughrah, al-Kulliyah and Tal Aghbar. However, PR statements were alloyed with significant loses to ISIS west of Jarabulus. Meanwhile, a large armored brigade of the Turkish Armed Forces were reported to have deployed 11 kilometers away from Manbij, where Kurdish forces are set to evacuate. 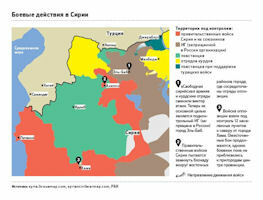 On the temporary cease-fire in the north became known in the evening on 30 August. Manbij Military Council, part of the "Democratic Syria forces" together with Kurdish groups agreed to a pause in the fighting with Turkish forces. But the ceasefire does not mean a truce, officials said on both sides. "We will liberate our lands from the Turkish army and its allies", - quotes Reuters the words of Ali Hajj, the speaker of the Military Council. "This is not peace and cease-fire, it is a pause, which will take some time", according to one of the leaders of groups supported by Turkey. Turkish Prime Minister Binali Yildirim said on August 31 his country's troops were to stay in Syria as long as "threats" against the Turkish state remained. 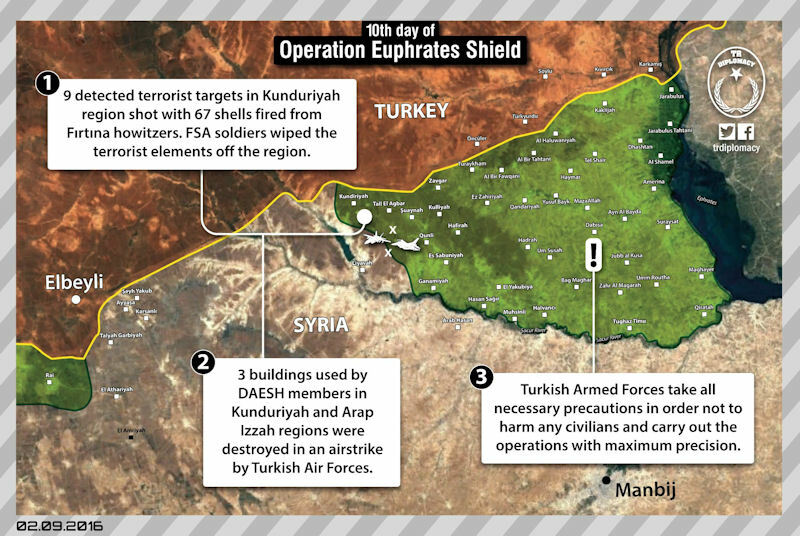 The stated objective of operation "Euphrates Shield" – to remove "terrorists" from the Turkish border – is vague, prompting growing speculation over Ankara's long term intentions. Turkish tanks entered al-Ra’i town in northern Aleppo 02 September 2016, as the Euphrates Shield’s forces began a push to meet with Jarablus pocket. Turkish armored vehicles on 02 September 2016 crossed into Syria through the border town of Çobanbey, the Syrian side of which is located in Aleppo Province and is known as Al Rai in Arabic. The opposition Free Syrian Army managed to take control of the town. The move was intended to open up another front against the DAESH terrorist organisation as part of Turkey’s Operation Euphrates Shield. Iran expressed concern over the continuation of Turkey's military incursion into Syria, urging all countries to respect the Arab country's national sovereignty and territorial integrity. "Although the fight against terrorism and efforts to maintain regional stability and security are an unchangeable and important principle in the foreign policy of peace-seeking countries in the region, this issue cannot and should not be used as a justification for violating the territorial integrity of another country by conducting military operations against that country without coordination with its central government, and by overlooking its national sovereignty," Iranian Foreign Ministry spokesman Bahram Qassemi said. 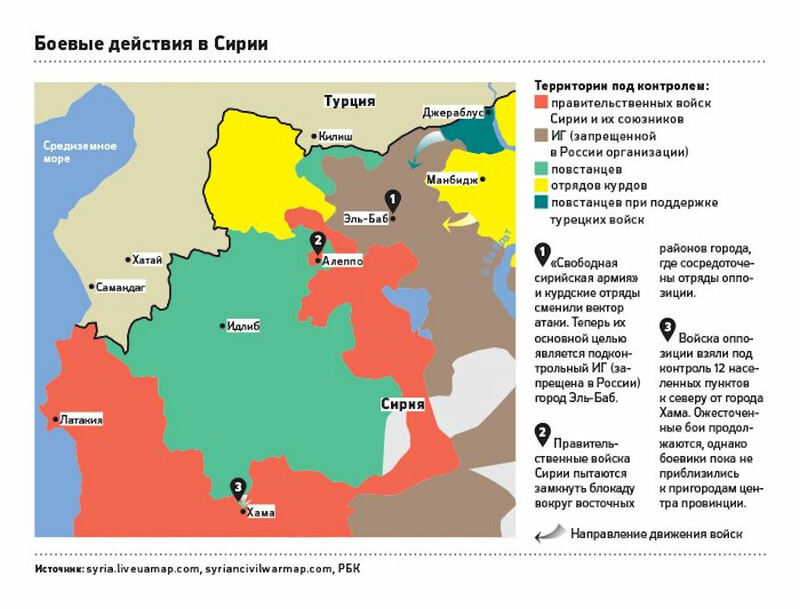 The Russian stance on Turkey's incursion into Syria illustrated that previous Russian support for the PYD was instrumental and motivated by the dynamics of the Turkish-Russian dispute. Once both countries mended their ties, the PYD's value for Russia declined significantly, but not completely. US President Barack Obama's special envoy for the global coalition to counter ISIL, Brett McGurk, said: "We want to make clear that we find these clashes [between Turkey and the YPG] - in areas where ISIL is not located - unacceptable and a source of deep concern." The US was trying to tread a fine line between its partnership with the YPG and relations with its longtime NATO ally Turkey. Turkey's move effectively halted the YPG's westward expansion. 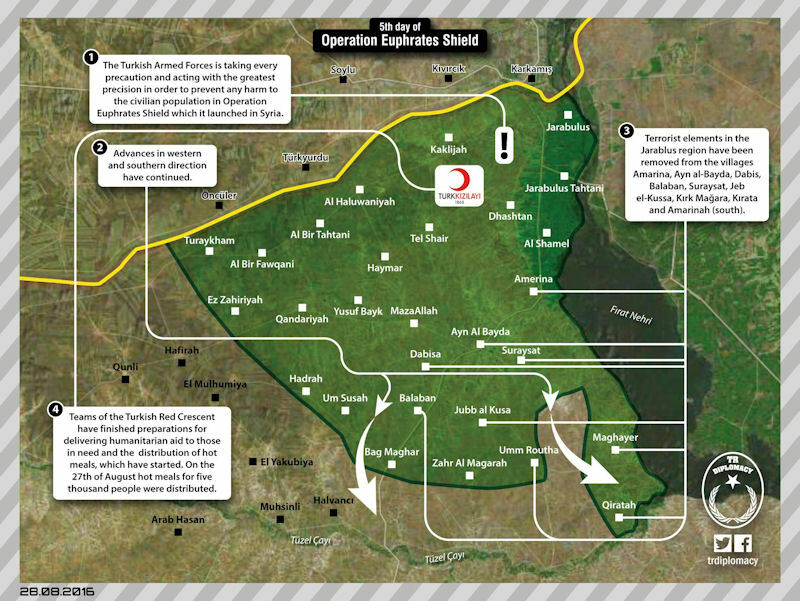 Before the operation the YPG was hoping to connect its Kobane and Afrin cantons and hence creating a linked-up statelet on the Turkish border. This was a prospect that Turkey had long denoted as its red line, inviting military intervention. Turkey on 29 March 2017 announced its military campaign inside northern Syria was over, without specifying whether it will pull its troops out from the neighboring country. Turkey's top advisory national security council chaired by President Recep Tayyip Erdogan said the half-year long offensive in Syria has been "concluded successfully." Prime Minister Binali Yildirim also said the operation has been completed but did not rule out new military campaigns inside Syria under a different name. Turkey-backed Syrian rebels had captured from jihadists several towns including Jarabulus, Al-Rai, Dabiq and finally Al-Bab, where the Turkish army sustained heavy casualties. The strategic town of Al-Bab, just 25 kilometers (15 miles) south of the Turkish border, had been the jihadists' last stronghold in the northern Syrian province of Aleppo. The major goal of the operation was to capture Manbij and to prevent the Syrian Kurds from maintaining control over the Syrian-Turkish border. But Ankara failed to take Manbij under its control. In early March 2017, Turkey and the Kurdish-dominated Syrian Democratic Forces (SDF) nearly clashed in Manbij. Moscow stepped in and brokered a deal between the Turks, the Kurds and Damascus. The Manbij Military Council handed control of several areas west of the city of Manbij to the Syrian Arab Army (SAA), as part of a Moscow-brokered deal to create a buffer zone between the Kurds and the Turkish armed forces. Ankara accepted the deal and signaled that it by no means opposed the establishment of the SAA's control over the northern Syrian city of Manbij.